My friend Cindi and her daughter Lara are embarking on a new adventure – and they sent me this stamp set to see if I’d help them get the word out! You might know them as the creatives behind Savvy Stamps….looks like their clear stamps will have the same great illustration style! Be sure to visit them at Flora and Fauna – and wish them well, as well as qualify to win this stamp set on their blog and Instagram! I like the brightness and simplicity of this card. wonderful scene and love your color choices. Love your little scene and their illustration style. Great blending display. Can’t wait for camping season and this just makes me more impatient! LOL TFS your cute card and Flora & Fauna! Your coloring is awesome (as usual), the little scene you created is so sweet. How exciting for them! I love the VW Bus. Too cute! Your copic blending on the tree is very cool! Wonderful card! I have already purchased 4 sets of the Flora and Fauna stamps. They are really cute and I have seen some great sample cards using these stamps and they have definitely inspired me. I so have the Adventure set because we are campers and I love sending our friends that camp with us cards like this. I’ve taken your Copic Jump Start Class and love how you stretch the Copic colors. Trying out different color combinations is so much fun! 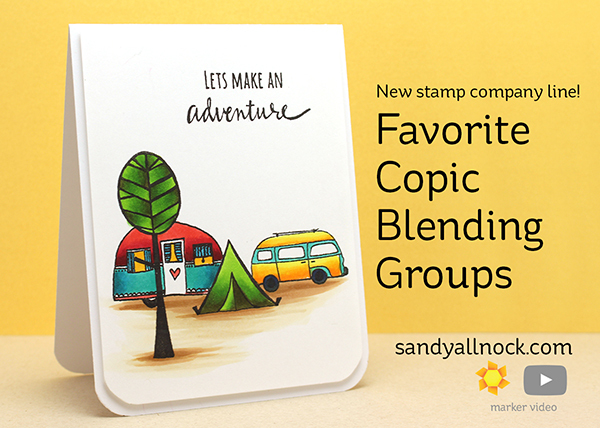 I can envision many uses for this stamp set, especially since my family, friends, and I are life-long campers! Your coloring is awesome. I had to purchase this set right away since I am an RVer. Thanks for sharing! As always, your coloring and composition is superb! Well done! Love all the detail and the colors you’ve used. Really makes the card shine.